History is like a bad dream from which one cannot wake. Though undoubtedly related to what once must have been real, history merely exists in our collective and individual imaginations and re-imaginations. It is shaped by our fantasy and wishful thinking just as much as by factors completely out of our control. And whenever we desire to tell someone about one of our particularly vivid dreams, we never find anyone ready to confirm that what we were positive we experienced just now ever truly existed. Like bad dreams, imaginations of history and how it all made sense at the time have their focal points as well as their blind spots. Like bad dreams, these may revolve around objects that at first seem almost insignificant and circumstantial, but all of a sudden develop a terrifying life of their own. 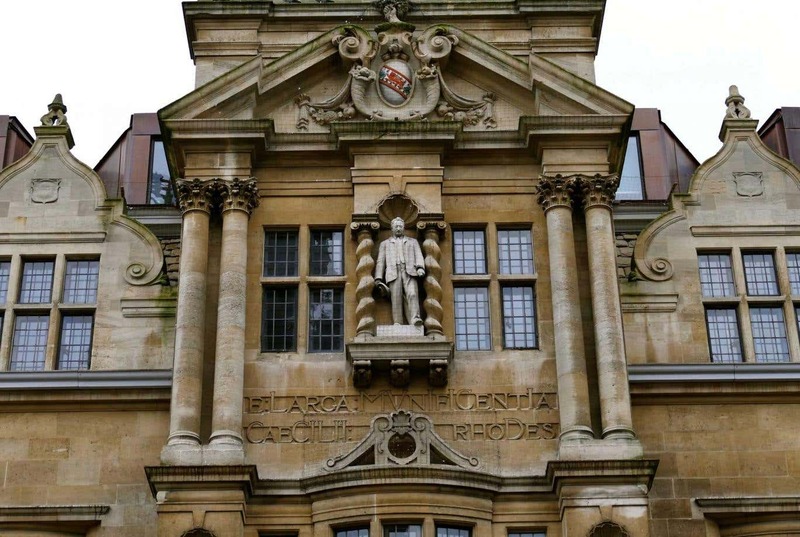 One such object – an object that has received a lot of attention recently and thus become a focal point of historical re-imaginations – is a statue of Cecil Rhodes, placed above the entrance of Oriel College, Oxford. Following a similar movement at the University of Cape Town, a campaign arose at Oxford urging the college to remove the statue of their prominent alumnus and benefactor – #RhodesMustFall. Yet, after much public debate and, more remarkably, a threat of current donors to withdraw millions, the college decided to keep the statue in its accustomed location. Removal of statues has a long history. To anyone with a background in Classical Scholarship the idea of damnatio memoriae, ‘condemnation of memory’, is a familiar concept. Unlike others, I do not see much of a problem with that; to me it seems like a liberating, perfectly rational act to rid oneself of the pictures of a harrowing, painful past that one would like to leave behind. It is an act of cleansing, a proxy that allows us to act against an effigy in a way that we may not be able, or willing, to act against a real person. Statues of fascist and communist leaders fell when the oppression of their regimes had been removed. Statues of Saddam Hussein fell, once it was safe to purify the urban landscape without risking political repercussions. Statues and inscriptions of disliked Roman rulers were defaced, altered, or destroyed after their deaths. But it would be mistaken to think that damnatio memoriae was the Romans’ sole response to the visual representation of those whose effigies might be seen as triggers of deeply traumatic memories. Publice autem ab exteris posita est Romae C. Aelio tr. pl. lege perlata in Sthennium Stallium Lucanum, qui Thurinos bis infestaverat. ob id Aelium Thurini statua et corona aurea donarunt. iidem postea Fabricium donavere statua liberati obsidione, passimque gentes in clientelas ita receptae, et adeo discrimen omne sublatum, ut Hannibalis etiam statuae tribus locis visantur in ea urbe, cuius intra muros solus hostium emisit hastam. Three statues of Hannibal, Rome’s quintessential foe, attested at Rome in the first century A. D. (Pliny famously died in A. D. 79 during the eruption of Mt. Vesuvius), some 250 years after Hannibal posed the single most dangerous threat to the Roman state. Pliny does not specify how Hannibal was depicted, who was responsible for the statues, or where exactly these statues were placed. The fact that display of Rome’s nemesis in public spaces of the city of Rome was apparently tolerable, however, would suggest that these effigies were positioned in a way that seemed acceptable; that it triggered debate regardless can be seen from the fact that Pliny mentions it as the high point of an enumeration of public statues that were ‘erected at Rome by foreigners’ (ab exteris posita … Romae). excepta deinde res est a toto orbe terrarum humanissima ambitione, et in omnium municipiorum foris statuae ornamentum esse coepere propagarique memoria hominum et honores legendi aevo basibus inscribi, ne in sepulcris tantum legerentur. mox forum et in domibus privatis factum atque in atriis: honos clientium instituit sic colere patronos. Columnarum ratio erat attolli super ceteros mortales, quod et arcus significant novicio invento. Statues are focal points of memoria, and to put them on pedestals means to showcase particularly noteworthy individuals who have risen above the masses in a manner that is worth remembering as well as inspiring. Does that apply to Cecil Rhodes in 21st century Oxford? There is hardly any need to explain why a statue of Cecil Rhodes would seem offensive to many nowadays (just as much as his presence was offensive to many then, just not those who put him on his Oxonian pedestal at the time), and there is hardly any requirement to explain how Rhodes’ ill-gotten gains have subsequently been used for rather better ends than Oxford’s generous donor himself would have imagined (or, in fact, approved of). Oriel College, partly driven by financial pressures of current donors (or so one is led to believe), decided to keep Cecil Rhodes on his prominent pedestal, claiming that they will ‘seek to provide a clear historical context to explain why it is there’. Rhodes’ statue and accompanying inscription, facing Oxford’s High Street. – Image source: http://static.independent.co.uk/s3fs-public/styles/story_large/public/thumbnails/image/2016/01/01/20/rhodes.jpg. How has this context changed after the pressure exercised on the college by its current donors? Can this ever be anything else than a symbol that Oriel College will always, absolutely always, honour their wealthy donors, no matter how unethical their behaviour has been – from colonialists of profoundly upsetting proportions to those who resorted to threatening financial consequences in a debate that should be about historical awareness, moral responsibility, and self-representation? It seems exceptionally unlikely to me that Oriel College will now add a line to this inscription, equally prominent in nature, stating precisely how it had become possible for Rhodes to become such a humanitarian (and why it was apparently impossible for the college to refuse the money at the time); but I remain open to pleasant surprises. Pliny teaches us that it is possible to look at statues of those who represent for trauma and shame; that it is possible to look at statues of Hannibal in Rome. But he also, quite rightly, teaches us that position is everything – and that the places where we put our statues is something that makes a statement about our current values and priorities, not merely about our past. The position of Cecil Rhodes’ statue at Oriel College could hardly be more elevated or focal. Suppressing our collective historical memory, damnatio memoriae, and iconoclasm cannot, and should not, be the answer. It will not fix the past, nor help us to redeem ourselves. But Oriel College’s façade is not a museum or exhibition hall with neat labels and documentation attached to it. It is its shopfront, it is the college’s most obvious and iconic interface to the present world, its most obvious form of self-representation. To pretend that focal objects don’t matter in our (and other people’s) imaginations of the past, as well as to call the debate over this statue a distraction, is hardly more compassionate than telling someone to stop having bad dreams while relentlessly reinforcing a focus on the effigy of a bogeyman that epitomises their suffering, while being a blind spot on our own conscience at best. What some have called preserving history is in actual fact a deliberate, almost fiendish misnomer, for this is not about preserving history, but about preserving control over the narrative and thus about preserving the outcomes of history, whilst conveniently shunning responsibility, in the hope that future generations will extend us the same courtesy. If it were truly and exclusively about preserving history (as some have fervently suggested), then this statue should have gone into an exhibition about Britain’s colonial past where it belongs in order to preserve memoria, but not remained on its pedestal, towering over Oxford’s High Street. This entry was posted in Epigraphy, Prose and tagged Big questions, Cecil Rhodes, Colonialism, Imperialism, Latin Inscriptions, Memory, Oriel College, Oxford, Public History, RhodesMustFall, Statues. Bookmark the permalink.